Now that I have a tentative plan for how I’m going to control all 300-some LED segments, the next step towards making this prop a reality is to figure-out the specifications for the LED displays. I’m going to start, as you’d expect, by looking at the original film props. This image should be familiar by now. This shot is the first time the audience sees the time circuits and is what everyone thinks of when they imagine “the time circuits” from the films. These are the ‘C’ car time circuits. 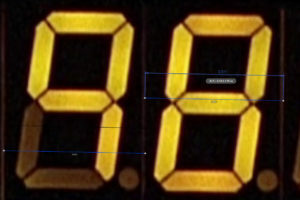 The 7-segment displays used in the film are likely off-the-shelf electronics parts. They were commonly available at the time the film was made, and there would be little reason for the props department to build something custom. Diegetically, it would make sense for Doc to buy stock displays as well. 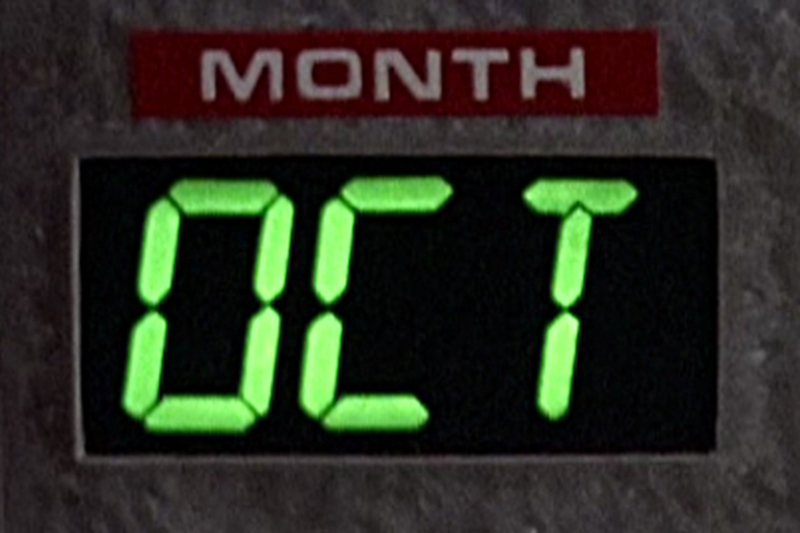 This is supported by the visible decimals on each display, although they are unused in the films. 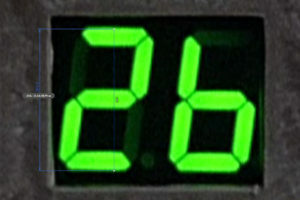 The 7-segment displays used for the ‘Last Time Departed’ year display. Note the separators between the digits and the decimal points. If we enlarge that photo, we can see that there are faint white lines between each digit. This shows that each digit is a separate component. Again, this makes sense for both the prop and the “real” time circuits: one part makes the wiring the exact same for each digit, and limits the numbers of different parts needed for each display. You’ll also see that the “font” used for the displays is hard-edged, unlike some modern 7-segment displays which have rounded edges. The displays also have a black face. If you look closely, you’ll see that the alphanumeric displays aren’t LED displays at all. In fact, they’re small pieces of glass masked off to look like proper displays with an incandescent light bulb behind them. One of the glass ‘month’ plates. Note the uneven spacing, the slight tilt on the ‘C’, and the segment intersecting the top of the ‘T’. Unlit segments are also not present/visible. This won’t work for this project, because I need the displays to be able to change. More on that in a minute. The regular standalone LEDs used for the “AM/PM” indicator and the seconds marker are ubiquitous, so I don’t anticipate any trouble sourcing them. I put that original ‘hero shot’ of the time circuits into a CAD program and resized it until the long edge for the middle casing was 8.5 inches long. I measured the vertical edges and got ~1.7″ for the height, which is a 4.6% difference. It’s not perfect, but good for making some educated guesses. Because the ‘master’ dimension used to calibrate the photo for measuring was along the horizontal, there is no percentage correction for that axis. What we get is what we get. Now with parallax error, lens distortion, and trying to hit exact marks with only 1080 pixel resolution – these measurements are just ballpark estimates. But they’re close enough to figure-out the standard sizes for the parts. Our first measurement is what is known as the “digit height”, or how tall the actual LED number is inside of the casing. I drew a vertical line, based on the image vertical, from the bottom of a 7 segment digit to its top on a few digits for each display. All three displays were about equal (as expected), measuring between 0.645″ and 0.65″. Applying that aforementioned 4.6% error correction for the vertical gives us a digit height of 0.615 – 0.62″. The closest standard size is a digit height of 0.6″. 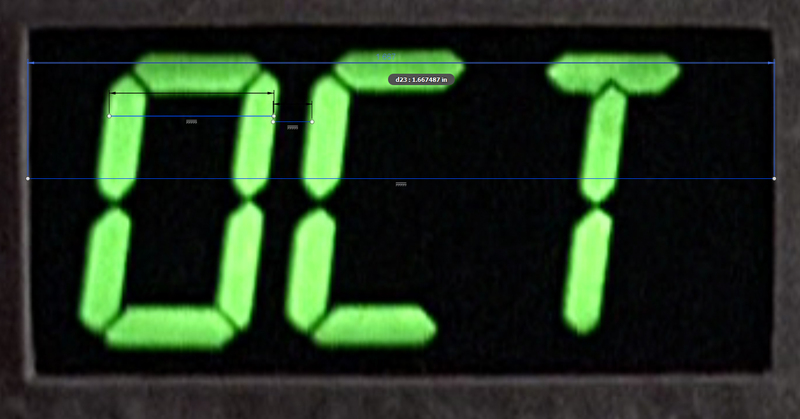 Because there are tiny white lines where the digits meet on the “Last Time Departed” display, I can measure the width of each 7 segment display with a fair bit of accuracy. The ‘Year’ display is best for this, because you can see both edges of a single display. I measured both the ‘9’ and the ‘8’, and got 0.521″ and 0.511″, respectively. I feel confident in saying that the display width is likely 0.5″, a nominal size for 7 segment displays. The alphanumeric display is just a glass plate, so I can’t measure the display width. But I can measure a number of other things, such as the character width, the spacing between characters, the overall text width (all three characters), and the size of the faceplate’s opening. Most of these should be self-explanatory, with the exception of “Individual Display Width”. That is the display size if there were three separate displays (digit width + digit spacing). The LEDs used for “AM/PM” and seconds are approximately 3 mm in diameter by my measurements. 3 mm is a standard LED size, which again makes sense and makes my life easy. Another great source of information for the DeLorean props is the documentary Outatime, about the 30th anniversary restoration of the ‘A’ car time machine. I recommend the film, it’s a fun watch if you’re a prop maker or Back to the Future fan in general. The replica time circuit PCBs, outside of their casings. 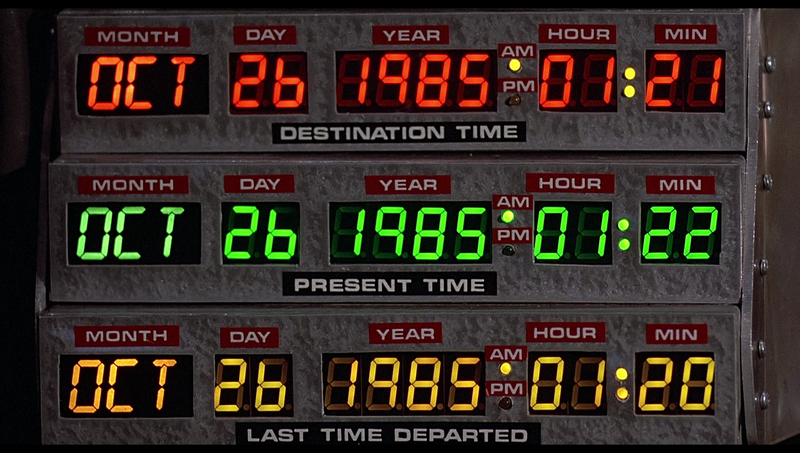 The original time circuits were non-functional, meaning that the display segments were controlled by a special effects box offscreen. 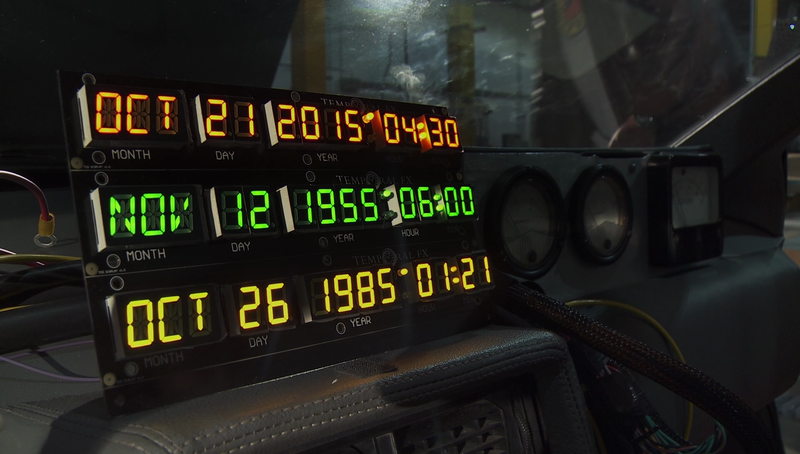 For the restoration however, the team created a “working” set of time circuits that can display any time or date inputted via the control box. Most importantly for my purpose, they did this just a few years ago in 2013 – meaning that the parts they used are theoretically going to be far easier to find. I have full confidence that the restoration team is a lot more knowledgeable about the time machine’s original props than I am, and I trust that the parts they chose are as screen-accurate as possible. 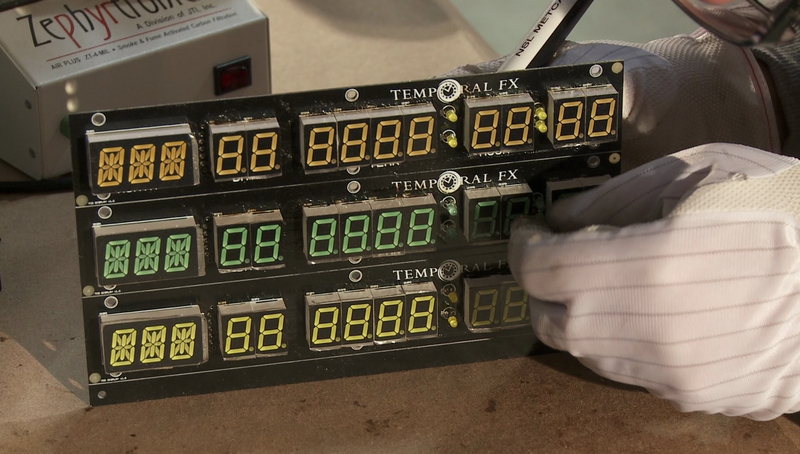 The restoration time circuits use single digit 7-segment displays for the numbers. One member of the restoration team, Mark Dehlinger, posted a thread about the time machine props on the DMCTalk forums where he says that the digit height is 0.60″. He also says that the 7-segment display units are just under 0.5″ wide and have a display height of 0.8″. From the screenshots, it’s also clear that they used hard-edged displays with a black face, just like the film. 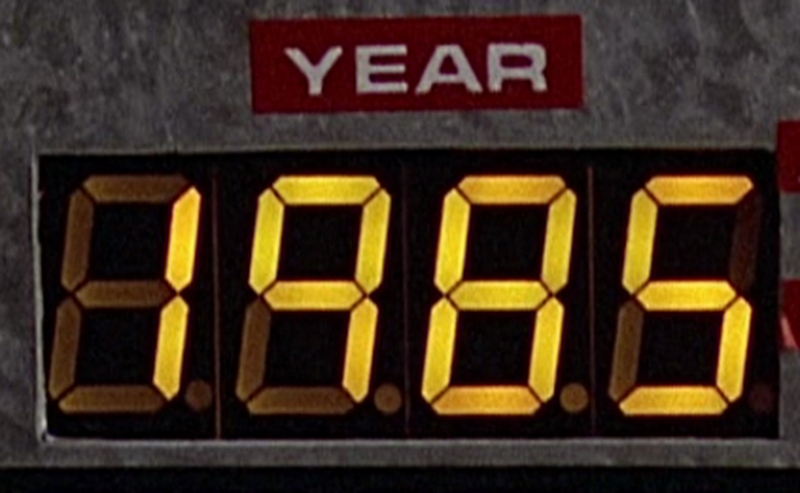 The alphanumeric displays in the restoration time circuits are 14-segment with 3 characters in one display. While I’ve asked Mark for some additional information about these displays, he has yet to get back to me. So let’s do some more CAD photogrammetry. 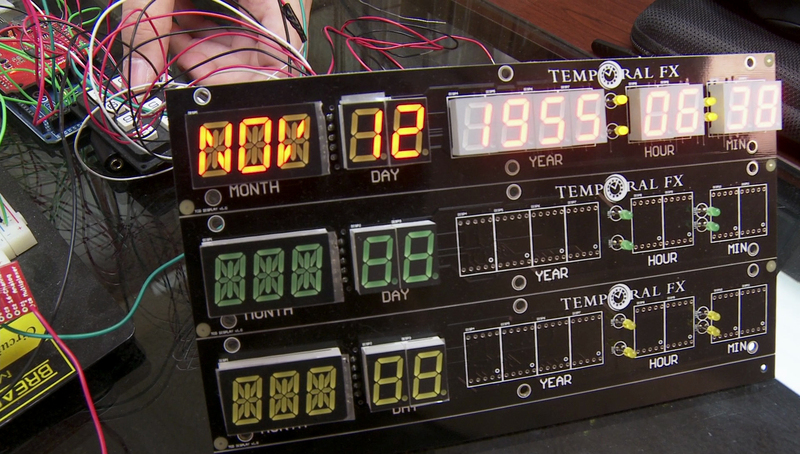 I took a screengrab from Outatime around 26:34 when they’re showing off the time circuits, straightened it the best I could in Photoshop, and tried taking some basic measurements in Autodesk Fusion 360. Here I was mostly trying to figure-out the overall display height. This shot was done up close with a wide lens, and it looks like the PCB might even be flexing a bit – so take these measurements with a grain of salt. I also tried using a more straight-on screenshot from 25:51 to find the widths. From this shot I measured the overall display width, the individual display width (if each digit was separate), and the character width. The digit sizes look like an exact match to the 7-segment displays, which would make them 0.60″ on the nose. Everything else is an estimate. I’d ballpark the margin of error at +/- 0.050 – any display in that range would probably be a perfect fit. There is some writing on the underside of the alphanumeric displays and on the right-hand side of the 7-segment displays that might aid in finding a datasheet, but the film’s resolution isn’t high enough to make it out. It certainly looks like the standalone LEDs used in the restoration displays are 3 mm run-of-the-mill LEDs. This was also confirmed by Mark. For my project specifically, I also would like the displays to be common-cathode because of the HT16K33 driver. But I can always swap the driver out if I find perfect displays that are common anode. 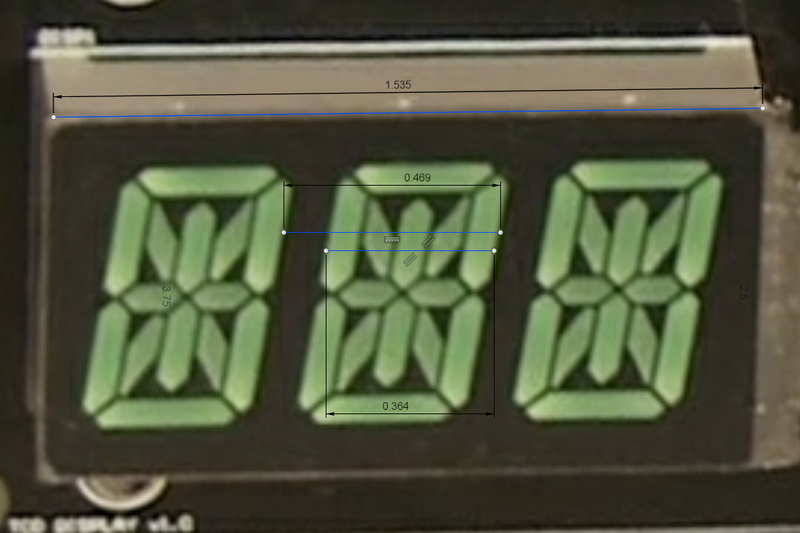 I’ll also need to make sure the 7-segment displays I buy have “hard” edges for each digit, and have a black face. This is a pretty solid list of specifications, and it gives me a fairly clear path for how to start my parts searching. From the little bit of research I did before I started this project I don’t think I’ll be able to find these exact displays, but hopefully I can find something that is close. All displays are 0.56″! In film was all 7 segments with mini lamp bulbs! Can I ask what your source for that is?